Enhanced plasma levels of NEFA have been shown to induce hepatic insulin resistance, which contributes to the development of type 2 diabetes. Indeed, sphingolipids can be formed via a de novo pathway from the saturated fatty acid palmitate and the amino acid serine. Besides ceramides, sphingosine 1-phosphate (S1P) has been identified as a major bioactive lipid mediator. Therefore, our aim was to investigate the generation and function of S1P in hepatic insulin resistance. The incorporation of palmitate into sphingolipids was performed by rapid-resolution liquid chromatography-MS/MS in primary human and rat hepatocytes. The influence of S1P and the involvement of S1P receptors in hepatic insulin resistance was examined in human and rat hepatocytes, as well as in New Zealand obese (NZO) mice. Palmitate induced an impressive formation of extra- and intracellular S1P in rat and human hepatocytes. An elevation of hepatic S1P levels was observed in NZO mice fed a high-fat diet. Once generated, S1P was able, similarly to palmitate, to counteract insulin signalling. The inhibitory effect of S1P was abolished in the presence of the S1P2 receptor antagonist JTE-013 both in vitro and in vivo. In agreement with this, the immunomodulator FTY720-phosphate, which binds to all S1P receptors except S1P2, was not able to inhibit insulin signalling. These data indicate that palmitate is metabolised by hepatocytes to S1P, which acts via stimulation of the S1P2 receptor to impair insulin signalling. In particular, S1P2 inhibition could be considered as a novel therapeutic target for the treatment of insulin resistance. Susann Fayyaz and Janin Henkel contributed equally to this work. The online version of this article (doi: 10.1007/s00125-013-3123-6) contains peer-reviewed but unedited supplementary material, which is available to authorised users. Enhanced circulating levels of NEFA have been indicated to induce hepatic insulin resistance , which is a major risk factor for the development of type 2 diabetes . Hepatic insulin resistance is defined clinically in terms of a failure of insulin to maintain glucose homeostasis, leading to hyperglycaemia. Unrestrained hepatic glucose production is a consequence of a reduced efficacy of insulin to suppress hepatic gluconeogenesis and glycogenolysis, while reduced hepatic glucose clearance results from an impaired insulin-dependent stimulation of glycogen synthesis . Insulin receptor downstream signalling has been extensively examined in an attempt to discover the molecular alterations induced by NEFA. One major branch of intracellular insulin signalling is the activation of the phosphatidylinositide 3-kinase (PI3K)/Akt pathway, which mediates most of its metabolic effects. Thus, stimulation of the PI3K/Akt pathway directly induces the phosphorylation and subsequent inactivation of glycogen synthase kinase-3β (GSK-3β), which in turn phosphorylates and inactivates glycogen synthase . Moreover, PI3K/Akt activation is involved in the modulation of glucokinase levels and hence activity . Both enhanced glucokinase activity and inactivation of GSK-3β in response to insulin contribute to enhanced glycogen synthesis. Exposure of hepatic cells to NEFA interrupts insulin signalling by inhibiting the PI3K/Akt pathway, but the relative contribution of the different potential mechanisms is still a matter of debate. An accumulation of NEFA in the liver results in oxidative stress, local inflammation and cytokine production . Moreover, bioactive lipid intermediates such as diacylglycerol (DAG) appear to accumulate in response to NEFA. Hepatic DAG formation is thought to stimulate classical and atypical protein kinase C (PKC) isoforms, which blunt insulin signalling by inactivation of the insulin receptor substrate . Of note, saturated and unsaturated fatty acids differ significantly in their participation in inducing insulin resistance, suggesting the formation of further specific bioactive lipids depending on the individual fatty acids . Thus, ceramides, which can be formed by a de novo pathway from the saturated fatty acid palmitate, have been indicated as interrupting several putative targets of insulin signalling . For instance, ceramides directly activate a PKCζ isoform that inhibits the translocation of Akt. Additionally ceramides stimulate the activity of cytosolic protein phosphatase, which accounts for the dephosphorylation of Akt . Once generated, ceramides can be further metabolised to a large array of bioactive sphingolipid metabolites. For example, ceramides can be hydrolysed by ceramidase to sphingosine, which can in turn be phosphorylated to sphingosine 1-phosphate (S1P) by sphingosine kinase (Sphk) . S1P is a potent signal mediator that affects multiple cellular functions. The multitude of different S1P-mediated actions can be explained by the fact that the sphingolipid on the one hand possesses intracellular targets and on the other hand acts as a ligand of the G protein-coupled receptor (GPCR) after secretion into the extracellular environment. Five high-affinity receptors for S1P, designated S1P1–S1P5, have so far been identified . S1P has been shown to increase glucose uptake into skeletal muscle via transactivation of the insulin receptor . In contrast, S1P interrupted insulin signalling in epithelial cells via an inhibition of Akt activity . Since S1P, depending on the tissue analysed, may apparently affect glucose and lipid metabolism in different ways, the aim of this study was to examine whether palmitate contributes to the formation of S1P, which may affect hepatic insulin signalling. Narcoreen was purchased from Merial (Hallbergmoos, Germany). Percoll and D-[U-14C] glucose were obtained from GE Healthcare (Freiburg, Germany). S1P was synthesised as described . C17-S1P came from Avanti Polar Lipids (Alabaster, AL, USA). FTY720-phosphate (FTY720-P) and JTE-013 were obtained from Cayman (Hamburg, Germany). Sphk inhibitor 2 (SKII), monoclonal rabbit anti-phospho AktSer473 antibody, monoclonal anti-total Akt antibody, monoclonal rabbit anti-phospho GSK-3βSer9 antibody, rabbit monoclonal anti-GSK-3β antibody, secondary anti-rabbit IgG horseradish peroxidase (HRP)-linked antibody as well as LumiGLO reagent and peroxide chemiluminescent substrate were obtained from Cell Signaling Technology (Frankfurt, Germany). Primers were synthesised by Eurofins MWG Operon (Ebersberg, Germany). All other chemicals were purchased from Sigma-Aldrich (Schnelldorf, Germany). Male Wistar rats (200–300 g) were purchased from Charles River (Sulzfeld, Germany). Male New Zealand obese (NZO) mice (28–35 g) were bred in-house in the animal facility of the German Institute of Human Nutrition (Nuthetal, Germany) and housed in groups (three–five animals per cage) under standard laboratory housing conditions with a diurnal 12 h light and dark cycle. The animals had free access to fresh tap water and food, and were kept in accordance with relevant national and international guidelines. The local authorities approved all the animal experiments (LUGV Brandenburg, Germany; V3-2347-3-2012). The mice (n = 15) were randomised into three study groups receiving a standard diet (SD), a high-fat diet (HFD) or an HFD plus JTE-013. All the diets were purchased from Altromin (Lage, Germany). The SD (Art. No. C1090-10) contained (wt/wt) 10 kJ % fat, and the HFD (Art. No. C1090-60) contained (wt/wt) 60 kJ % fat. The dietary intervention was started at 6 weeks of age and was continued for 4 weeks. When hyperglycaemia (blood glucose level over 20 mmol/l) occurred in week 3 in the HFD groups, JTE-013 intervention was initiated and applied for 7 days. JTE-013 (3 mg/kg) was dissolved in PBS containing DMSO (5%) and BSA (3%) and administered by i.p. injection. The control animals received the vehicle. Samples for measuring blood glucose were collected from the tail vein of fed mice between 09:00 and 11:00. Blood glucose was determined using an Ascensia ELITE XL (Bayer HealthCare, Leverkusen, Germany). At the end of the experiment, the mice were fasted overnight for 14 h. All the mice received an i.p. injection of insulin (2 mU/kg). Isoflurane anaesthesia was induced 15 min later and 1 ml of blood was withdrawn by cardiac puncture. The animals were killed by cervical dislocation, and the liver was harvested for further investigations. Density gradient-purified hepatocytes were prepared and cultured as previously described . The cells were plated on 35 mm diameter culture plates (1 × 106 cells/plate), and experimental treatments were performed after 24 or 44 h .
Tissue samples from liver resections were obtained from patients undergoing partial hepatectomy. The experimental procedures were performed according to the guidelines of the charitable state-controlled foundation Human Tissue and Cell Research, with the informed patient’s consent approved by the local Ethical Committee of the Charité University of Medicine Berlin (EA2/076/09). The cell isolation process was performed using a two-step collagenase P perfusion technique . Isolated hepatocytes were cultured in Williams’ medium E containing 10% FCS, insulin (1 μmol/l), HEPES (15 mmol/l), dexamethasone (100 nmol/l), 100 U/ml penicillin and 100 μg/ml streptomycin, 1% l-glutamine, 1% non-essential amino acids and sodium pyruvate (1 mmol/l) overnight on collagen-coated culture plates (1 × 106 cells/plate). After an initial 12 h incubation to allow the cells to attach to the substratum, the medium was changed to Williams’ medium E 1% (vol./vol. ), antibiotics (10 U/μg penicillin, 10 μg/μl streptomycin), dexamethasone (100 nmol/l) and insulin (0.5 nmol/l) without FCS. Experimental treatments were performed after 44 h of culture in Williams’ medium E containing 1% (vol./vol.) antibiotics and dexamethasone (100 nmol/l). Ceramides and S1P were extracted and quantified as recently described [19, 20]. Briefly, lipid extraction of tissue samples, primary hepatocytes or conditioned cell media was performed using C17-S1P and C17-ceramide as internal standards. Sample analysis was carried out by rapid-resolution liquid chromatography-MS/MS using a Q-TOF 6530 mass spectrometer (Agilent Technologies, Waldbronn, Germany) operating in the positive ESI mode. The precursor ions of S1P (m/z 380.256), C17-S1P (m/z 366.240), C16-ceramide (m/z 520.508) and C17-ceramide (m/z 534.524) were cleaved into the fragment ions of m/z 264.270, m/z 250.252, m/z 264.270 and m/z 264.270 respectively. Quantification was performed with Mass Hunter Software (Agilent Technologies). Total RNA was isolated using the total RNA isolation system (Roboklon, Berlin, Germany). The RT reaction was carried out using the FermentasAid first-strand cDNA synthesis kit (Fermentas, St Leon-Rot, Germany). A volume of 50 ng cDNA solution was subjected to quantitative real-time PCR using a LightCycler480 and the SYBR-Green PCR master mix (Roche Diagnostics, Applied Science, Mannheim, Germany). β-Actin or GAPDH was used as normalisation control. The primers used in this study are shown in electronic supplementary material (ESM) Table 1. Glycogen synthesis was assessed by measuring D-[U-14C]glucose incorporation into glycogen as recently described . Briefly, cultured hepatocytes were preincubated for 5 h with 1 μmol/l S1P in M199 medium containing 1% penicillin/streptomycin and dexamethasone (100 nmol/l). Subsequently, the medium was replaced by medium containing 1 μCi/ml D-[U-14C]glucose and after 30 min hepatocytes were stimulated with insulin (10 nmol/l) for 2 h. Glycogen was precipitated and the amount of D-[U-14C]glycogen was determined by scintillation counting. Western blot analysis was performed as recently described . Briefly, cells or tissue samples were lysed in radioimmunoprecipitation assay buffer and lysates were centrifuged and boiled in SDS sample buffer. After separation by SDS-PAGE, gels were blotted onto polyvinylidene fluoride membranes and blocked with non-fat dry milk. Membranes were incubated with the primary antibodies followed by incubation with secondary anti-rabbit IgG HRP-linked antibodies. Detection was performed with LumiGLO according to the manufacturer’s protocol using a ChemiDoc XRS+ system (Bio-Rad Laboratories, Munich, Germany). Data are expressed as the mean ± SEM of results of three or more independent experiments. Statistical analyses (t tests) were performed using GraphPad Prism 6.0 software (GraphPad Software, La Jolla, CA, US). Values of *p < 0.05 and **p < 0.01 indicate a statistically significant difference vs control experiments. An examination of palmitate incorporation into sphingolipids in primary rat hepatocytes revealed that there was a significant increase in the formation of sphingolipids. Exposing primary rat hepatocytes to palmitate (0.3 mmol/l) over a time period of 24 h induced not only an intracellular formation of C16-ceramide (Fig. 1a) but also an intracellular increase in the further metabolite S1P (Fig. 1b). A significant enhancement of both C16-ceramide and S1P levels in response to palmitate was detectable after a stimulation period of 4 h. Maximum concentrations of these sphingolipids were reached at 12 h. At this incubation time, the C16-ceramide concentration increased from a basal level of approximately 210 to 450 pmol/106 cells, whereas the S1P level was enhanced from 6.0 to 8.6 pmol/106 cells in response to palmitate. To analyse whether S1P is also secreted into the extracellular environment, levels of S1P were determined in the supernatant fraction of cultured hepatocytes. A basal level of 1.5 pmol could be detected in 1 ml of medium, indicating that the hepatocytes produced and released endogenous S1P. Most interestingly, a strong increase in S1P in the extracellular environment occurred in the presence of palmitate. After 8 h, the S1P concentration was already significantly higher than in the respective controls. Maximum S1P levels were detected after 12 h of palmitate exposure. Thus, the S1P level increased approximately 2.5-fold from 1.7 to 4.4 pmol/1 ml medium (Fig. 1c). It is well known that palmitate plays a central role in hepatic insulin resistance. As the S1P level increased in response to palmitate, the influence of both palmitate and S1P on insulin-mediated levels of glucokinase, a rate-controlling enzyme for hepatic glycogen synthesis, was examined in primary rat hepatocytes. An approximately fivefold induction of glucokinase was seen when the cells were stimulated with insulin (10 nmol/l) for 2 h (Fig. 2a, b). However, preincubation with palmitate reduced the insulin-dependent glucokinase induction in a time-dependent manner with a maximum reduction after 12 h (Fig. 2a). This coincided with the maximum palmitate-induced generation of S1P. Therefore, the role of S1P in glucokinase levels was examined. Similarly to palmitate, S1P attenuated the insulin-dependent induction of glucokinase. The inhibitory effect of S1P was dose dependent with a significant reduction in the insulin-induced expression of glucokinase at a concentration of 100 nmol/l, whereas a maximum inhibition occurred at 1 μmol/l of S1P (Fig. 2b). To prove an involvement of S1P generation in the inhibitory action of palmitate on insulin signalling, glucokinase levels were measured in the presence of SKII. As expected, SKII diminished the ability of palmitate to increase S1P levels (Fig. 2d). The inhibitory action of palmitate on insulin-induced glucokinase levels was also significantly decreased in the presence of SKII (Fig. 2c). These results indicate that the formation of S1P in response to palmitate contributes at least in part to the inhibitory action on insulin signalling. To study the biological consequences of an S1P-mediated inhibition of insulin-induced glucokinase levels, hepatic glycogen synthesis was examined. In accordance with its effect on glucokinase levels, insulin (10 nmol/l) increased the incorporation of radiolabelled glucose into glycogen about twofold. However, when hepatocytes were preincubated with S1P (Fig. 3a), insulin almost completely lost its ability to stimulate glycogen synthesis, confirming the crucial role of S1P in hepatic insulin signalling. It is well known that glucokinase expression and glycogen synthesis occurs in response to insulin, at least in part, downstream of the PI3K/Akt-pathway. Consequently, activation of PI3K/Akt in response to insulin and S1P was studied. Pretreatment of hepatocytes with S1P reduced the ability of insulin to induce Akt phosphorylation of Ser473. A maximum reduction was visible after a preincubation time of 15 min with 1 μmol/l of S1P (Fig. 3b). Moreover, PI3K/Akt contributes to the phosphorylation of GSK-3β, a direct inactivator of glycogen synthase. In accordance with an inhibitory effect on PI3K/Akt, a 15 min pretreatment of hepatocytes with S1P (1 μmol/l) resulted in a considerable inhibition of the insulin-mediated phosphorylation of the downstream target GSK-3β (Fig. 3c). As S1P acts as both an extracellular ligand for cell surface receptors and an intracellular signalling molecule, the levels of S1P receptor subtypes in rat hepatocytes were measured. Real-time PCR revealed that all five S1P receptors were present. The relative amount of S1P receptor mRNA was S1P2 > S1P1 > S1P3 > S1P4 > S1P5 (Fig. 4a). As S1P2 is the dominant S1P receptor in hepatocytes, and S1P2 has moreover been identified as inhibiting insulin signalling in epithelial cells, the effect of S1P on insulin resistance was measured in the presence of the S1P2 antagonist JTE-013. S1P completely lost its ability to impair insulin-induced glucokinase production in the presence of JTE-013 (Fig. 4b). In line with this, the S1P-mediated inhibition of insulin-elicited Akt phosphorylation was diminished when the hepatocytes were preincubated with JTE-013 (Fig. 4c). These data suggest that the S1P2 receptor subtype is essential to crosscommunicate with insulin signalling. The role of S1P2 signalling on insulin resistance was also assessed in the NZO mouse model. As expected, there was a drastic increase in blood glucose levels in HFD-fed compared with SD-fed mice over a time period of 4 weeks. Most interestingly, after treatment of HFD-fed mice with JTE-013, their glucose levels did not further increase compared with vehicle-treated HFD-fed mice (Fig. 5a). To prove whether JTE-013 mediated this action via an improvement in hepatic insulin resistance, Akt phosphorylation in the liver was measured after insulin injection. As shown, Akt phosphorylation was significantly decreased in HFD-fed compared with SD-fed mice. Treatment with JTE-013 partially restored insulin-mediated Akt phosphorylation in HFD-fed mice (Fig. 5b). Moreover, S1P determination in the liver revealed a significant increase in the sphingolipid in HFD-fed compared with SD-fed mice (Fig. 5c). Conversely, S1P2 receptor levels in all three groups were unchanged (data not shown). The profile of S1P receptor subtypes was examined in primary human hepatocytes obtained from partial hepatectomy, indicating that S1P2 was the most abundant receptor subtype, although all other S1P receptor subtypes were present in these cells (Fig. 6a). In analogy to rat hepatocytes, S1P formation increased in human hepatocytes in response to palmitate (Fig. 6b). Thus, S1P levels rose from approximately 12 to 20 pmol/106 within the cells, while in the extracellular environment S1P levels increased from 5 to 10 pmol/1 ml medium. To examine the role of S1P in insulin signalling, PI3K/Akt phosphorylation was studied. As expected, insulin induced a pronounced activation of PI3K/Akt signalling in human hepatocytes. Importantly, pretreatment of human hepatocytes with S1P inhibited insulin-stimulated PI3K/Akt phosphorylation (Fig. 6c, d). As in rat hepatocytes, S1P2 was identified as the crucial receptor subtype for inhibiting insulin-mediated pathways in human cells. Thus, S1P lost its ability to inhibit insulin-stimulated PI3K/Akt phosphorylation in the presence of the S1P2 antagonist JTE-013 (Fig. 6c). These data suggest that increased S1P levels may contribute to hepatic insulin resistance. In this context, we studied the role in insulin signalling of the S1P receptor agonist FTY720-P, the active metabolite of the drug fingolimod approved for the treatment of multiple sclerosis. FTY720-P was not able to inhibit the insulin-mediated phosphorylation of PI3K/Akt on Ser473 (Fig. 6d). This is in accordance with the fact that this immunomodulator acts on all S1P receptor subtypes except S1P2. It is well established that increased plasma levels of NEFA contribute to the development of hepatic insulin resistance . Although the uptake of fatty acids into the liver is at least in part regulated by fatty acid transporters, there is a correlation between liver and plasma concentrations of fatty acids [22, 23]. The treatment of hepatocytes with NEFA such as palmitate inhibits insulin-mediated Akt phosphorylation and downstream signalling pathways including GSK-3β and forkhead box protein O1 . Consequently, plasma glucose levels are increased due to an impaired stimulation of glycogen synthesis and unrestrained gluconeogenesis. Nevertheless, several studies indicate that it is not the fatty acids themselves but secondary metabolites that are responsible for the inhibitory effect on insulin signalling. Upon entry into hepatocytes, fatty acids are rapidly esterified with coenzyme A to fatty acyl-CoAs, which can either be shuttled into beta-oxidation or be transferred to a glycerol backbone, resulting in the formation of mono-, di- and triacylglycerols . In particular, the formation of DAGs has been connected to insulin resistance . Genetic studies downregulating diacylglycerol acyltransferase-2 have indicated that a decrease in DAG content is associated with improvements in insulin signalling and in vivo hepatic insulin sensitivity. DAG-mediated PKC activation has been linked to fatty liver and hepatic insulin resistance in several rodent models and in humans . Thus, PKCε may interrupt insulin signalling via serine/threonine phosphorylation of the insulin receptor . A variety of studies indicate that saturated and unsaturated fatty acids differ in their ability to inhibit the insulin signal chain. In particular, palmitate influences insulin-mediated glucose metabolism, while this saturated fatty acid did not lead to triacylglycerol accumulation. This is in contrast to oleate, which causes an extensive triacylglycerol accumulation and does not interrupt insulin signalling but rather prevents saturated fatty acid-induced insulin resistance . It is well known that the saturated fatty acid palmitate is necessary for the de novo synthesis of ceramides . Several lines of evidence support a role for these sphingolipid derivatives in the pathogenesis of insulin resistance. Ceramides have been shown to activate atypical PKCs such as PKCζ, which interferes with insulin signalling . In accordance with this, an inhibition of ceramide synthesis ameliorates obesity-induced hepatic insulin resistance . Treating obese mice with myriocin, an inhibitor of serine palmitoyltransferase 1, specifically attenuates the increase in ceramide formation without any change in DAG level and improves glucose tolerance. In HepG2 cells, however, it has been shown that fumonisin, an inhibitor of ceramide synthases, decreases palmitate-induced ceramide levels, which was not connected with an improvement in insulin signalling . Nevertheless, ceramides can be further metabolised to the bioactive sphingolipid S1P. Moreover, it is of interest that, in the presence of fumonisin, S1P levels are enhanced, although the underlying molecular mechanism is not well defined. It is well known that elevated plasma S1P levels are a feature of human and rodent obesity and diabetes [32, 33]. Indeed, this study clearly indicates for the first time that hepatic S1P formation is significantly increased in response to palmitate in vitro as well as in vivo. Increased levels of S1P can be detected within the cell as well as in the extracellular environment. This is in accordance with the fact that S1P can be actively transported by ATP-binding cassette (ABC) transporters, namely ABCC1 and ABCG2, in a regulated manner . Thus, it is not surprising that exogenous S1P is able to inhibit insulin signalling in primary rat as well as human hepatocytes. Depending on the cell type, it has been shown that there is a divergent crosscommunication between insulin signalling and S1P. Thus, an insulin-mimetic effect of S1P occurs in skeletal muscle as the pharmacological inhibition of Sphk1 diminishes insulin-mediated glucose uptake, while its overexpression mimics insulin action in vivo . Moreover, S1P shares with insulin the ability to elicit the differentiation of myoblasts. Examination of the molecular mechanism has indicated that S1P transactivates the insulin receptor in a ligand-independent fashion . Moreover, it has been shown that key enzymes of ceramide metabolism in rat muscles are modulated in response to physical activity. This is accompanied by an increased insulin sensitivity, suggesting a crucial role of sphingolipids in skeletal glucose homeostasis . However, it has also been demonstrated that S1P is able to interrupt insulin signalling in epithelial cells as the bioactive sphingolipid inhibits the hormone-mediated proliferation of keratinocytes via stimulation of the S1P2 receptor subtype . This is in accordance with a variety of studies indicating that S1P2 inhibits proliferation in several cells such as mouse embryonic fibroblasts and germinal centre B cells [36, 37]. The present study provides evidence that S1P2 stimulation is able to attenuate insulin-dependent Akt phosphorylation. Indeed, an inhibitory effect of the S1P/S1P2 axis on Akt activation has been identified, especially in immune cells. It has been suggested that, by inhibiting Akt activation, S1P2 helps to restrict germinal centre B cell survival and localisation to an S1P-low niche at the follicle centre . Moreover, S1P has been shown to inhibit the endocytotic capacity of dendritic cells by S1P2 receptor activation and Akt inactivation . In hepatocytes, Akt inhibition is connected with an impaired glucose utilisation and glycogen synthesis. Thus, it is not surprising that the administration of JTE-013, a specific S1P2 antagonist, to mice ameliorated the streptozotocin-induced blood glucose elevation and reduced the incidence of diabetes . Indeed, our studies indicate that JTE-013 also diminishes the blood glucose increase in HFD-fed NZO mice. In line with this, hepatic insulin signalling is improved in the presence of the S1P2 antagonist. Our findings are of potential interest as FTY720, a structural analogue of sphingosine, is a potent immunosuppressant approved as a new treatment for multiple sclerosis . FTY720 becomes active in vivo following phosphorylation to form FTY720-P, which binds to all S1P receptors except S1P2 and prevents the release of lymphocytes from lymphoid tissue. Indeed, we have indicated here that FTY720-P is not able to inhibit insulin-mediated Akt phosphorylation and glucokinase levels, confirming the essential role of S1P2 in insulin resistance. This is consistent with experiments indicating that the oral administration of FTY720 to db/db mice did not lead to hyperglycaemia. 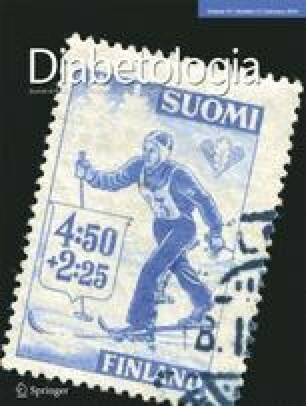 In fact, diabetic mice showed a normalisation of fasting glucose levels after 6 weeks of treatment with FTY720. It has been suggested that this effect was due to a stimulation of Akt activity in beta cells . This study indicates that S1P influences Akt activity in a divergent manner depending on the levels of the S1P receptor subtypes. Several lines of evidence support a role of S1P1 and S1P3 in Akt activation in response to S1P or FTY720 . Measurement of the receptor profile in rat and human hepatocytes indicated a predominant expression of the S1P2 receptor subtype, explaining the inhibitory effect of S1P on insulin-mediated Akt activation. Taken together, our results indicate that palmitate, which is discussed as a crucial factor in the development of insulin resistance, can be metabolised by hepatocytes to S1P. This bioactive sphingolipid may act in an autocrine mechanism via stimulation of the S1P2 receptor to diminish insulin signalling. In particular, these findings indicate that S1P2 inhibition can be considered as a potential therapeutic target for insulin resistance. Therefore, the development of S1P2 receptor subtype-specific antagonists might be highly important for such medicinal interventions (Fig. 7). We would like to thank M. Kuna, I. Zschaler, M. Haseloff (Institute of Nutritional Science, University of Potsdam, Potsdam, Germany) and A. Mika (German Institute of Human Nutrition, Max Rubner Laboratory, Nuthetal, Germany) for their excellent technical support. All authors participated in the conception and design, or analysis and interpretation of the data, contributed to drafting and revising the manuscript, and gave final approval of the version to be published.